The Burner EBP Fin (Tyr Fins) is a floating short blade swim fin that mimics race-day cadence while building lean muscle. The Burner EBP (Elevated Body Position) Fin is constructed of ultra-soft high buoyancy rubber. An ergonomic foot pocket allows for decreased levels of tendon strain with efficient strength building for the ankle, and the Wall Gripper Footpad keeps the foot anchored during flip turns and push-offs. NOTE: For Female equivalent, please size down 1-2 sizes. These are nice comfortable fins. I wear between a size 8-8.5 women's and have a wide foot - the medium was perfect. I transitioned from a pair of older, stiffer and slightly longer Speedo fins. These allow me a shorter faster kick and a good workout. My second pair of Tyr Burner EBP fins....love, love them. Great for the pool and great for a workout. 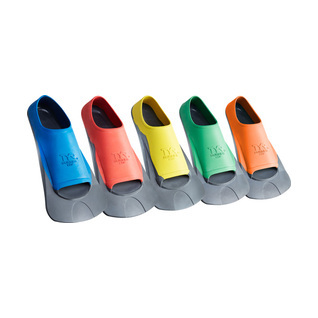 I love these fins because the top material that covers your foot is soft and flexible. After 13 months if swimming 4 or 5x a week, my old pair developed a tear. I think they held up quite well and are a great value. Soft rubber, comfy, light weight awesome fit..bought large (red ).. Perfect for my women's size 11 foot. Woo hoo!! The fins are good for swimming in the pool. better and quality than Finis Zoomers, in my opinion. I like these fins as a "switch" from my Aquasphere's which are my primary fins. The TYR' are sturdy, heavy, comfortable and it helps shape a full, well rounded workout. I love my new fins. They are comfortable and perfect for freestyle workouts. Our local pool won't allow long fins but these burners are OK. Not the best for back stroke.